A highly delicate white flower, jasmin has been used since the beginning of Haute Perfumery history. The Jasmine Layering Oil is an opulent flowery poem, full of fragrant white flowers and enhances the mysterious notes of Flowerbomb. Flowerbomb Jasmine Twist Layering Oil is rated 5.0 out of 5 by 3. Rated 5 out of 5 by Lindsey from Perfect addition to your flowerbomb collection I absolutely love this scent. I’m slightly obsessed with Flowerbomb and the fragrance oil twists are a perfect addition to your collection. 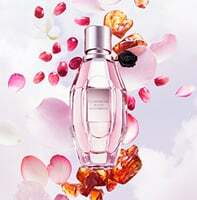 They can be worn alone, with the flowerbomb or really can be paired with other fragrances that you like. It’s fun to layer scents. I currently have both the rose and jasmine scents. I would say jasmine is my favorite of the two but I really love both. I do wish they lasted longer at times but then again I appreciate reapplying to switch things up from a day to evening scent. Highly recommend this his product. Rated 5 out of 5 by MrsFYI from It’s a LAYERING oil. I love this idea! It smells beautiful and makes it so much nicer. ***If you’re wondering why this doesn’t smell so strong (or as strong as the perfume), it’s because THIS OIL IS DESIGNED TO BE *LAYERED* WITH THE PERFUME for added focus on that scent. *** I like the Rose and Jasmine, but I’m not crazy about the Musk, but that’s just not my thing. These are so nice because I like the perfume by itself, but my favorite flower scents stand out more with the oil. And remember my friends... If something isn’t right about a product, try reading the info on the box.